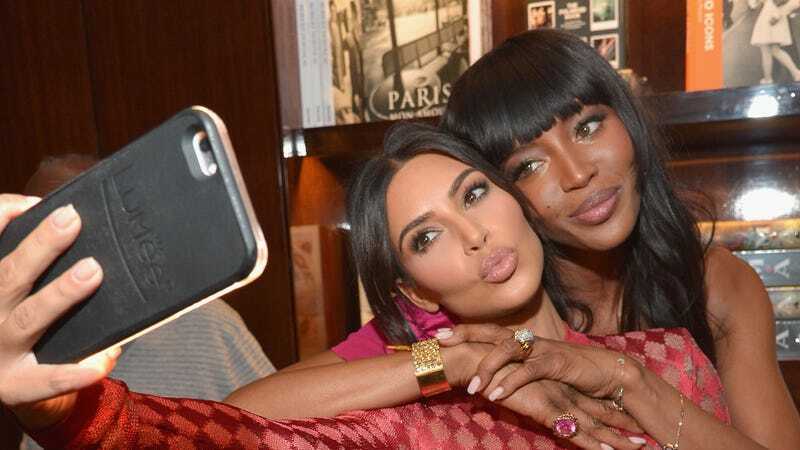 Kim Kardashian and Naomi Campbell take a selfie during the Los Angeles launch of ‘Naomi’ on April 28, 2016 in Beverly Hills, California. Is it appreciation or appropriation? We may never know for sure, but after weeks of seeing many of her iconic looks revived by Kim Kardashian and Kylie Jenner, Naomi Campbell is making sure we all put some respect on her name by reminding us who wore it first—and arguably, best. As of late, Campbell herself has gotten into the act, throwing some subtle, supermodel-level shade at her famous friends by quietly posting shots of herself in the original article every time a copycat appears. Naomi answered with her own Alaia tribute on March 7. Naomi came through with #MOOD—and her own shade—on Monday. The message? No drama—just give credit where credit’s due. Many of the looks the “Karjenners” are now flaunting were initially made famous by Campbell; it’s perfectly fair to remind the masses that fashion doesn’t exist in a vacuum. It’s called acknowledgement—and it’s certainly something Kardashian has readily given to any number of designers she’s worn. But all appropriation aside, we doubt there’s any lasting love lost between Kardashian and Campbell. After all, game ultimately recognizes game. Kim Kardashian and Naomi Campbell attend the Los Angeles launch of ‘Naomi’ on April 28, 2016.